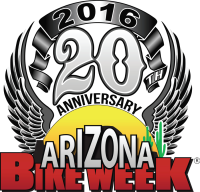 It’s the twentieth anniversary of Arizona Bike Week and they’re throwing a party like you’ve never seen before! First item on the agenda is the concert line-up. This year they’ll be putting up two headliners per night. That means your five-day pass gets you not four, but eight concerts! In addition to ramping up the musicfest aspect of the event, ABW has also amplified the focus on the passion that brings us all to a rally… MOTORCYCLES!! This year, along with all the stunt shows, live music, vendors, bike shows, demo rides and exhibitions you’ve come to expect from this annual extravaganza, there are a couple big new features you’re going to want to check out. Introducing the HellRacers Dome at WestWorld! This indoor dirt arena will feature flat track racing at its finest, with teaser races scheduled for Friday and Saturday and finals scheduled for Sunday. Another major addition to the agenda is the Legends Classic and Vintage Motorcycle Auction in the Legends Pavilion at WestWorld. Do you love the excitement and energy of a live auction? Then you’re going to want to check out this Saturday afternoon event. The enti re site plan has changed with all the new elements being added. Fortunately, WestWorld is a 360 acre park, with plenty of room for ABW to grow. This year the event will incorporate more areas of the site than ever before. Check out the camping map on the travel page at azbikeweek.com for a preview of the new layout. And to top it all off, even with all these extra attractions and concerts, ABW has dropped prices from last year by seven bucks! A five-day pass to Arizona Bike Week 2016 is currently available on-line for just $53 and as always, your general admission pass gets you into all the concerts and festivities, including the HellRacers Dome and Legends Pavilion. Single day passes are available as well, starting at just $17. You may want to grab yours before prices increase. That’s a whole lot of rally for fifty three bucks! This is the party that’s been twenty years in the making. Don’t be the one who missed it!